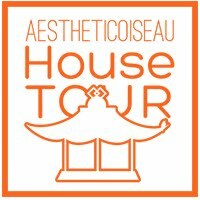 Check out the full house tour here...it's pretty spectacular and brimming over with Jamie's signature style. But back to the china cabinet...my own dining room cabinet is the same scale and a corner cabinet as well. And since the day I set it up, it displays all of my crystal...and that's it. No color, no dishes, just clear crystal. Don't get me wrong, my crystal is gorgeous but looking at it all together isn't that thrilling. Why have I never thought to fill this cabinet with pretty baubles and colorful pieces?? I have no idea. And what's weird is that I have very similar pieces to the ones displayed in this cabinet, but they are tucked away in drawers and cabinets. That will change. In other news, see the large blue & white porcelain urns in the 2nd picture? 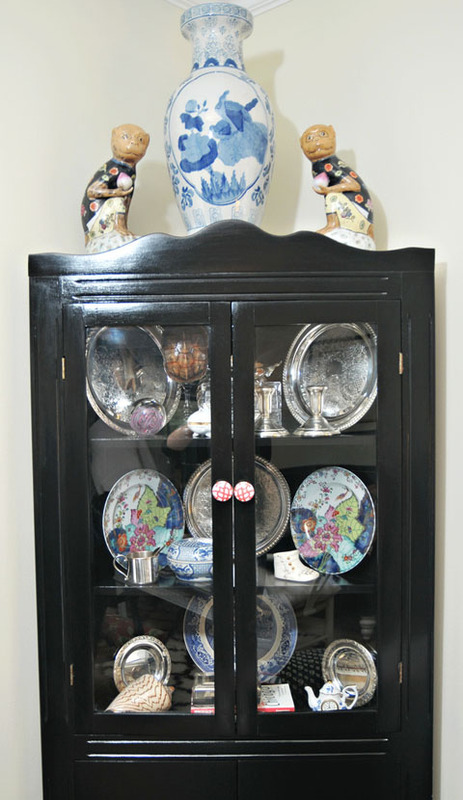 One is used atop the china cabinet and one is toward the entry to the room. Well, we just got back from the beach and the same (almost exact) set of urns was one of my scores. They were priced at $80 for the pair and due to a friendly shop owner and my pointing out of a crack, I got them both for $50. Don't know where I'll use them yet, but that's a minor detail that does not concern me. 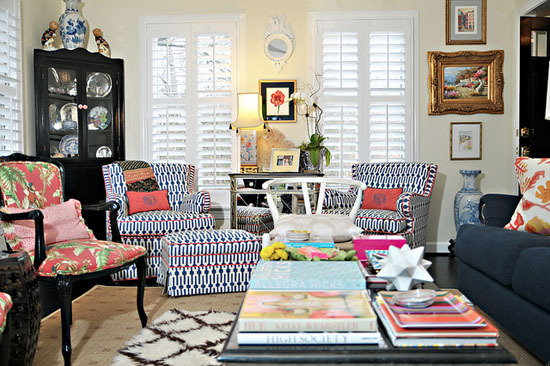 I love those two chairs with the navy and white fabric! Their scale seems large, but my first reaction was to turn them into lamps. No matter what I'm jealous of your find. I love Jamie's design work... her colors are captivating!!! I can see a redo in your corner china cabinet already!!! Hm, wonder where you might put one of your new blue urns?? ?